There are situations when we have access to a Wi-Fi network (we got a password), but the signal is weak and not all of our devices can work stably or even connect to a wireless network. This can be faced when using neighbor Wi-Fi from home in front, and in quite legitimate situations: for example, there is the only one access point to the entire floor in a hotel (or even in a lobby). As a result, for example, a laptop can connect to a Wi-Fi network with a weak signal, but the mobile phone simply does not see the Wi-Fi network. Some routers have the feature to repeat Wi-F signal and they can be used to amplify a weak Wi-Fi signal. But not always at hand a router with Wi-Fi signal amplification function (especially on trips), so I will consider a slightly different option. One of the wireless adapters should be powerful enough and sensitive: an external wireless adapter with an high gain antenna (and even better directional high gain antenna), and the second wireless adapter should support the AP (access point) mode, but it does not have to be powerful, it is enough built-in laptop Wi -Fi adapter, because its task will be to distribute Wi-Fi Internet within the room. In general, nothing special: the standard gentleman's set of a Wi-Fi networks auditor, probably, each of us already has it all. The algorithm is as follows: using a more powerful Wi-Fi adapter, we connect to a remote access point. Using the second Wi-Fi adapter, we create a new access point that uses the Internet connection of the first Wi-Fi adapter. To this new access point will be able to connect our ‘weak’ devices (mobile phones). As a result, although the mobile phone connects to our access point with a stable strong signal, it will use the Internet of a remote access point with a ‘weak’ signal. Also, Internet access will be on the computer itself. It is necessary to achieve a stable connection to an access point with a weak signal. To do this, move the Wi-Fi adapter (if it's external and if the length of the cord allows it) around the room, and turn the directional antenna in different directions (if you have one). 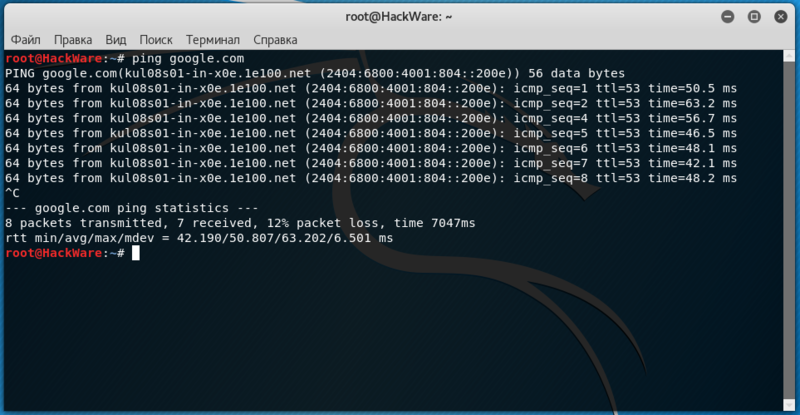 You can monitor the quality of the network by indicators, as well as using the ping command, or Internet speed checking services (for example, speedtest.net/run). This is an optional step. If using Router Scan by Stas'M or RouterSploit you managed to gain access to the router admin panel, you can change the signal level in the wireless network settings. This setting can be called TX Power (as in the screenshot below, where I set the value to High), or somehow different (the ratio of performance and energy savings, etc.). The address of the router will be after default via, for example, 192.168.1.1. The following information is intended for Linux users. We will do all the actions on the command line, there we will get the desired result faster than if we try to make the necessary settings in Network Manager. As an operating system, I use Kali Linux. 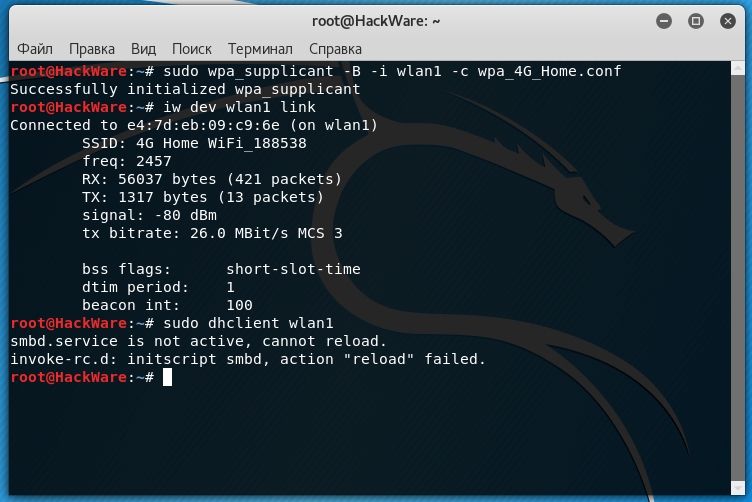 Actions in other Linux operating systems are similar, but you need to install the packages wpasupplicant and create_ap. Note, after disabling NetworkManager, the Internet will be lost! So, I have two wireless wlan0 and wlan1 interfaces. To connect to a remote access point, I want to use wlan1. Therefore, to raise my access point, I will use the remaining interface wlan0. Here, -B means to demonize the process (makes it works as a background process). 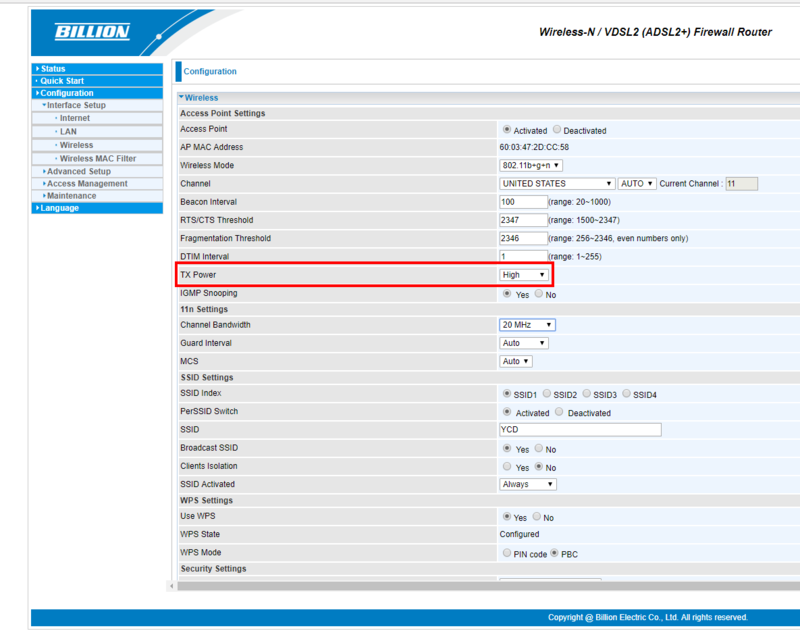 After the -i switch, specify the name of the wireless interface wlan1 (replace with the name of your interface). And after the -c switch, I specify the configuration file wpa_4G_Home.conf, which you also need to replace with your own. If something goes wrong, then run the same command without the -B switch to see its detailed output. Now we will set up our AP, which will connect our phones and other devices with low-power Wi-Fi transmitters. We will use the script create_ap which will greatly simplify our task. Now on mobile devices, you will see the access point you created, when connected, mobile devices will have access to the Internet. Please note that my mobile is not able to reach the 4G Home WiFi_188538 access point, which is the ‘donor’ of the Internet access. If there are problems with access to the Internet, first check the connection to the access point with a weak signal, because in this scheme it is the weakest link that can cause problems.